The cook book comes as hard cover with thick paper and has over 200 pages. It’s stuffed so to speak. The content is split into Appetizers, Salads and Soups, Sandwiches and Pizza, Primi – Pastas, Polentas and Risottos, Sauces, Sides and Vegetables, Seafood, Poultry and Meats, and Desserts. You see, the title holds what it promises. You get a complete overview of Italian dishes and good diversity. This is not Mrs. Matticchio Bastianich’s first cook book so we know she knows what she is doing. Each recipes not only has the English name but also the Italian name written down. I guess this will help if you ever travel to Italy you know what you want to order. A short introduction to the recipe is given as to its history. I like these kid of stories, it tells me why a recipe was chosen and gives me some insight. Also, the recipe states how much it will serve. 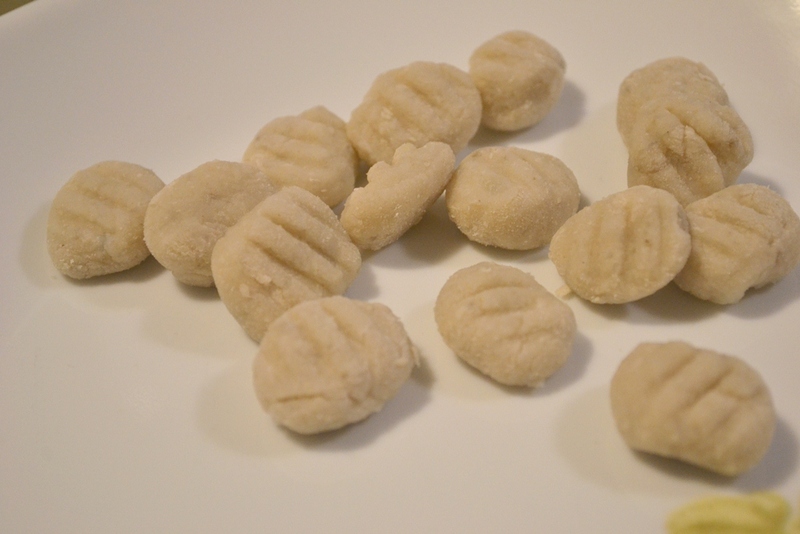 In the case of gnocchi you can feed six people. The ingredients are listed, though no dashes are used. I do like dashes or numbering, it seems more organized to me. The instructions are well written and clear, but again, no numbering. Thought not all recipes are accompanied by a pictures the cook book itself has 65, which is pretty good for the size of this cook book. Overall, this is definitely a cook book you want to have in your possession. Well rounded with a good overview of Italian cuisine and clear instruction; you couldn’t ask for more. The recipe is excerpted from Lidia’s Favorite Recipes – 100 Foolproof Italian Dishes, from Basic Sauces to Irresistible Entrées by Lidia Matticchio Bastianich and Tanya Bastianich Manuali. Copyright © 2012 by Alfred A. Knopf. Reprinted with permission from the publisher Alfred A. Knopf, a division of Random House, Inc.
Riced potatoes through a sieve. Tip: I used Russet potatoes and they worked fine. I also used black pepper due to not having white pepper. That worked fine as well. 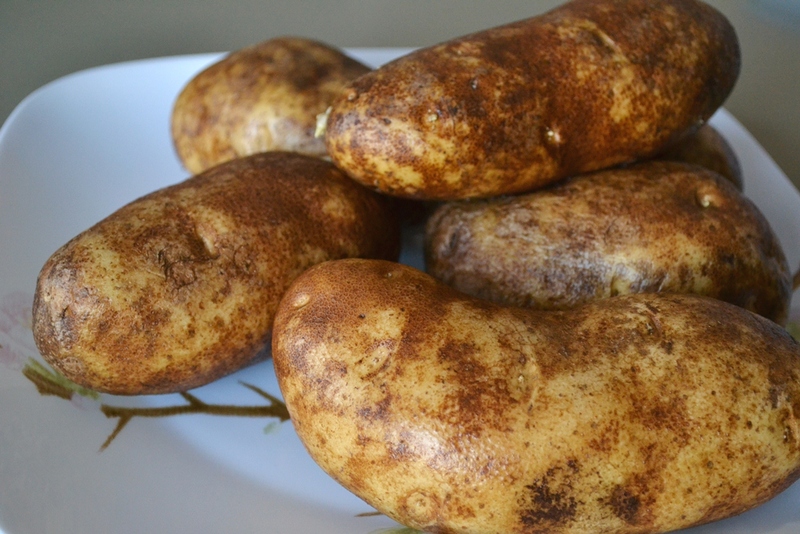 Cooked the potatoes in their skin for about 40 min or until they are soft and you can easily pierce them with a fork. Remove from the water and let them cool so that you can peal them. Rice the potatoes with a potato ricer or use a meshed sieve. Careful: a meshed sieve might discolour the potatoes due to the metal. This happen to me but I would say it depends on the quality of the sieve. 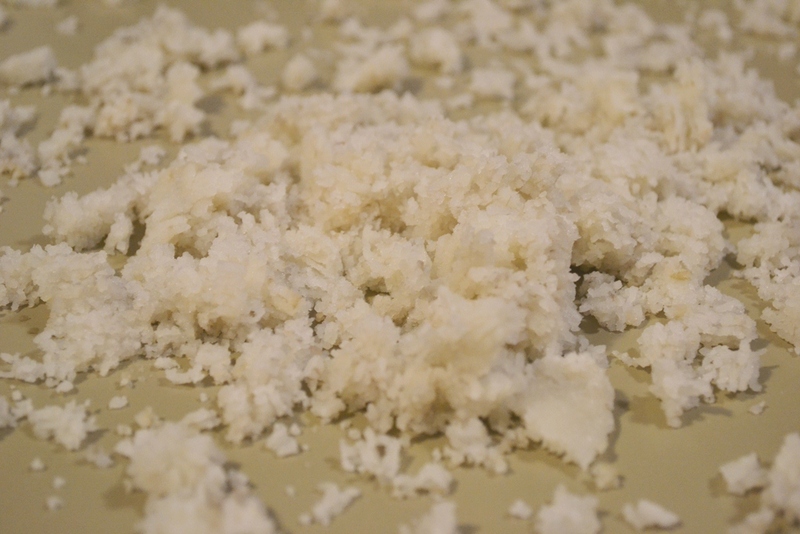 Spread the riced potatoes so that as much surface is exposed as possible. Let cool completely. Bring a big pot of water with 2 tbsp. of salt to a boil, about 6 quarts should be enough. Gather the potatoes into a mound on a cool surface, form a well and add the beaten eggs mixed with 1 tsp. of salt and ground pepper to it. Then sprinkle some of the flour on top while mixing all together. I only needed 2 1/2 cups of flour to make a workable dough. The kneading process should not take longer than 10 min, otherwise you will have a sticky dough, which needs more flour. This will make the gnocchi heavy. Divide the dough into 6 equal parts and roll each out into a long string of about 1/2 inch diameter. 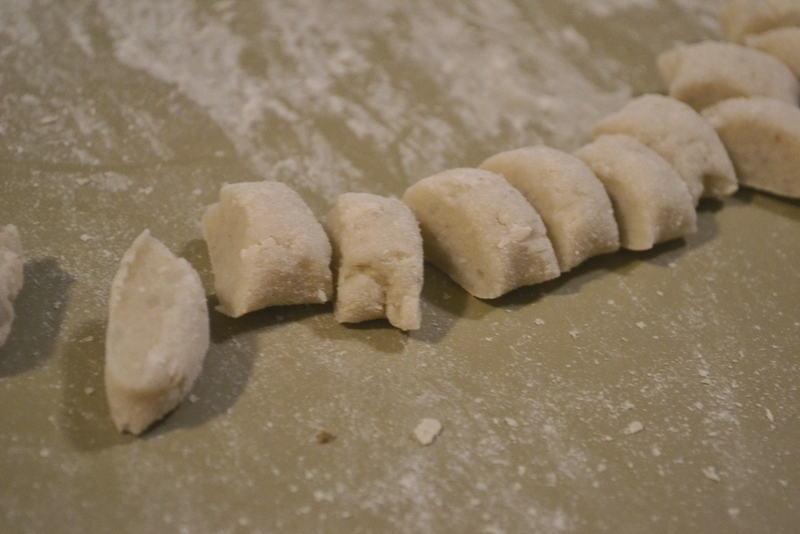 Cut each string every 1/2 inches to make the gnocchi. Each gnocchi was a bit point on the edges due to cutting so I gave them a quick roll in my head so they would be more oval. Then press a fork into on side to give it the ripped effect. Use a fork to make the favmous ripped effect. Boil the gnocchi in the water until they float on the surface, stirring in between so they do not stick to the bottom or each other. Remove them with a skimmer or slotted spoon and place them in a sieve to let excess water drip off. Serve them on a warm plate with butter and cheese or sauce and cheese to your liking. 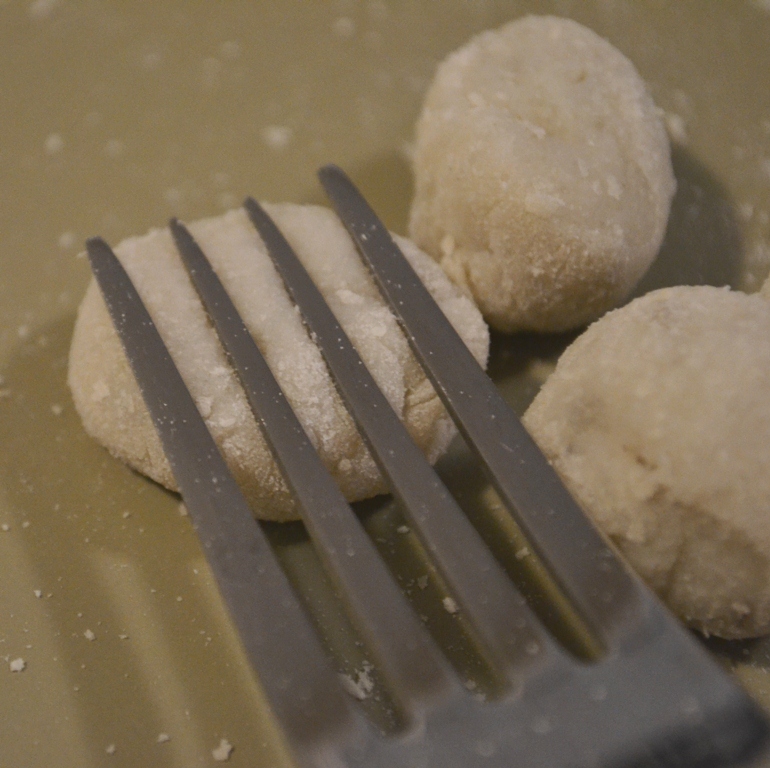 Though it is a bit labour intensive, the gnocchi turned out perfectly. I give them a quick toss in the frying pan to brown them lightly before serving with tomato sauce. 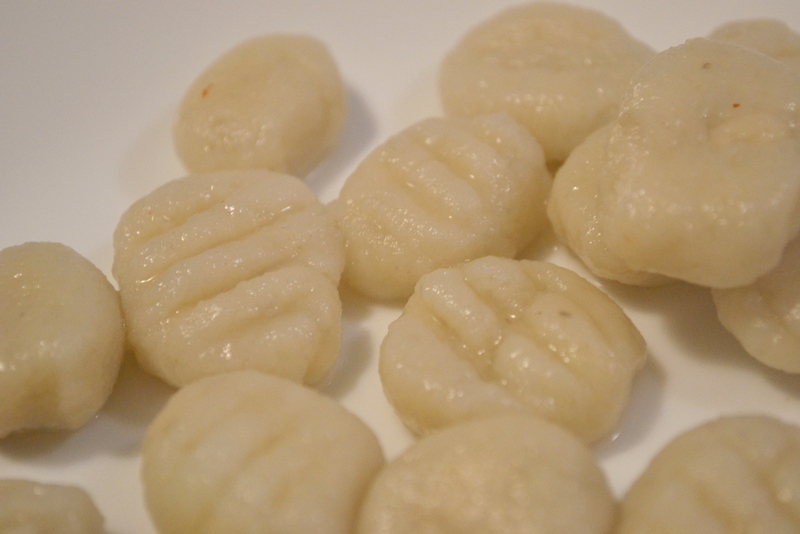 Your gnocchi look beautiful! I could never get mine to look right, especially with the fork technique, so I switched to buying it in the grocery stores instead. Someday I’ll get it right though! Thanks, it was my first try and I am really happy that it worked out so well. If you try with a smaller batch you can get more practice. Besides, it doesn’t matter how they look like as long as they taste good. So true! I froze the extras before boiling them, and I found that they tasted better. Not sure why, but I’ll take it!